It's a thin line between liking punk pop with emo overtones and disliking it strongly. It's on this thin line that Motion City Soundtrack finds it equilibrium near perfection. The more I play the record the more I start liking it. The more the nuances the band weaves into its songs stick out and make Go shine. The secret is in the voice of singer Justin Pierre. He manages to stay away from the o-look-at-me-and pity-me strain emo singers put into their voices. And then the band goes way beyond any comparison in this direction with a beautiful ballad like 'Everyone will die'. Undoubtedly this may have to do with the fact that the band is around for a while. In 2012 the band entered it's 16th year and 11th in the present line up. Go is their fifth album and again released through punk-famed label Epitaph. The music has only slightly to do something with punk. It's simply to soft toned and certainly to soft voiced. Pierre's voice is too high toned to be a punk singer. There also is no anger there. Confusion perhaps, compassion, certainly and moulded by life itself for sure. That these different emotions are laid into his vocal contribution does wonders to the quality of this record. Musically the band flourishes in melodic, very fine-polished punk pop songs in the best U.S. tradition. 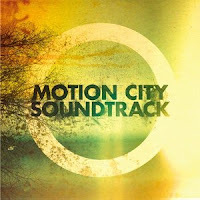 From The Cars and The Knack to bands like Weezer and Fountains of Wayne, Motion City Soundtrack follows in a fine line of bands. Just like the best songs of these bands, MCS dares to look beyond a pre-ordained format and varies in tempos, approach and emotions, but always keeps melody and harmonies as its anchors. A nice guitar line as an extra up front or in the back of the mix to explore. On top of it all comes the way that Justin Pierre and main songwriter and guitarist Joshua Cain sing together, assisted by bass player Matthew Taylor and drummer Tony Thaxton, bringing the music of MCS to a next and very pleasant to listen to level. Maybe everything is a little too licked and overly clean. Towards the end of the album, including the bonus tracks, an undertone of conformity creeps in, a feeling of haven't I heard this before? This is the only flaw as far as I'm concerned as the overall feeling remains one of great pop songs. MCS obviously tries for the perfect pop song and in their own way they've succeeded with flying colours.